Financial commentators have routinely misunderstood the fundamental reason for the dollar’s strength, attributing it to foreigners’ desperate need for dollars. In fact, non-US holders of dollars hold it in record amounts, with over $4 trillion in deposits in correspondent bank accounts alone, and a further $930 billion in short-term debt. This $5 trillion of total liquidity was the last reported position, as at end-June 2017. Speculative dollar demand since then, driven by interest rate differentials, will have added significantly to these figures. The continuing US trade deficit, currently running at close to a trillion dollars annually, is both an associated and additional source of dollar accumulation in foreign hands. Meanwhile, the same US Government data source reveals that US residents’ holdings of foreign securities was $6.75 trillion less than the foreign ownership of US securities, and the US Treasury reports that major US market participants (i.e. the US banks and financial entities operating in the spot, forwards and futures contracts) sold a net €2.447 trillion in the first nine months of 2018. Assuming these sales were not absorbed by official intervention on the foreign exchanges or by contracting bank credit, they can only have added to foreign-owned dollar liquidity. According to the World Gold Council, central bank gold reserves total 33,757 tonnes, worth $1.357 trillion at current prices. 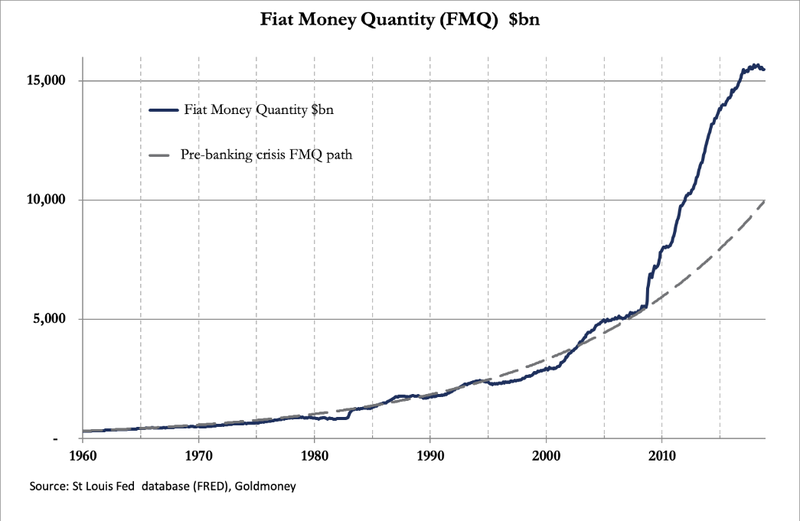 Global fiat money is estimated to total about $90 trillion, which suggests there’s 66 times as much in global cash and bank deposits as there is gold to back it Admittedly, issuers have different gold-to-currency ratios, but overall this suggests the gold price would be far higher if a sustainable level of currency convertibility is to return. 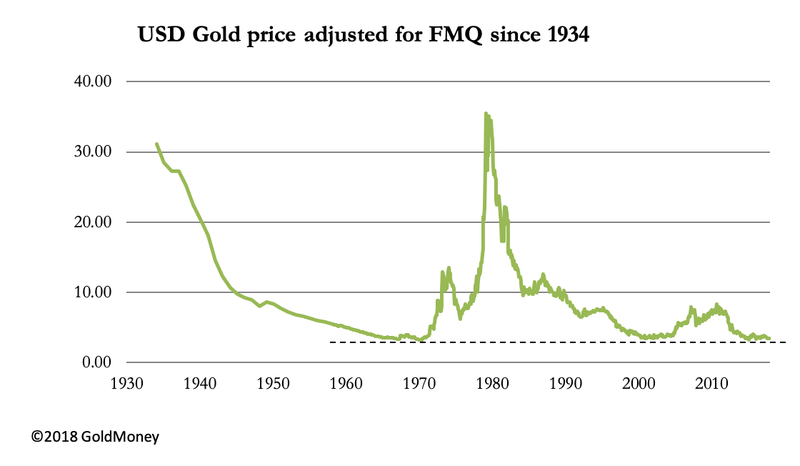 Demand for physical gold consistently exceeds mine supply. Central banks are accumulating bullion, adding 425 tonnes in the year to September 2018. Chinese private sector demand continues at a steady pace, which measured by withdrawals from the Shanghai Gold Exchange, is running at a 1,900-tonne annualised rate. India’s total gold imports were 919 tonnes in the year to end-September (according to the World Gold Council), so adding identified central bank demand to private sector demand from India and China, these three sources account for 3,344 tonnes annually, which is the same as global mine supply. 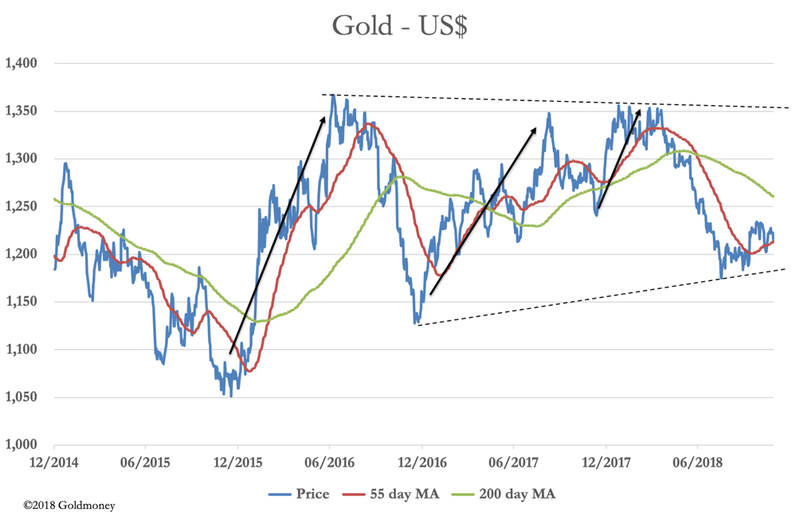 Net demand from the rest of the world and from unrecorded categories is satisfied from the existing above-ground stock of bullion, which we estimate to be about 175,000 tonnes. Only an unknowable fraction of this is available for market liquidity. The most identifiable swing-factor is ETF demand, which saw outflows of 103 tonnes in the three months to September. 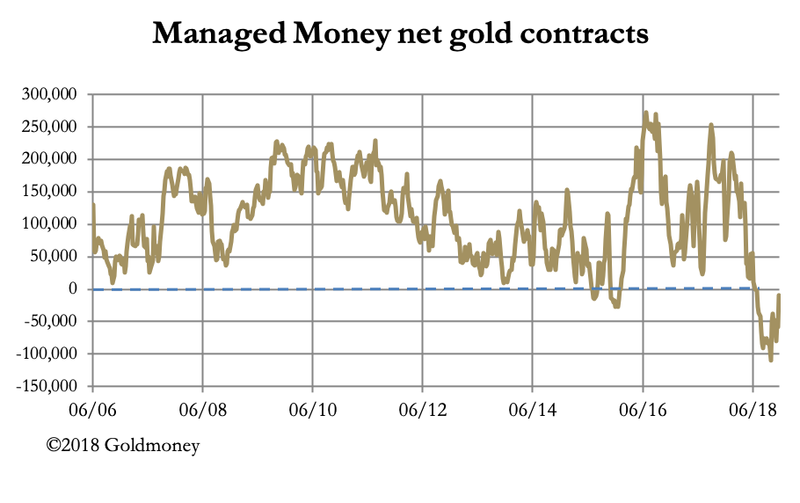 Looking back over recent years, another substantial ETF outflow was in 2016 Q4, when the gold price bottomed, and in 2015 Q2 to Q4 saw net outflows every quarter. It appears that ETF demand is acting as a contrary indicator of future price trends.